We are starting the third week of BM# 41 and I have taken up "Cooking with Alphabets". To make things more complicated, I decided to challenge each day with a specific cooking mode. I was having that in mind when I wrote that as a clause, however it wasn't clear enough and it was clarified when it was specifically asked. By then somebody said they were ready with their post based on one cooking medium. So it was decided that we will choose only one. 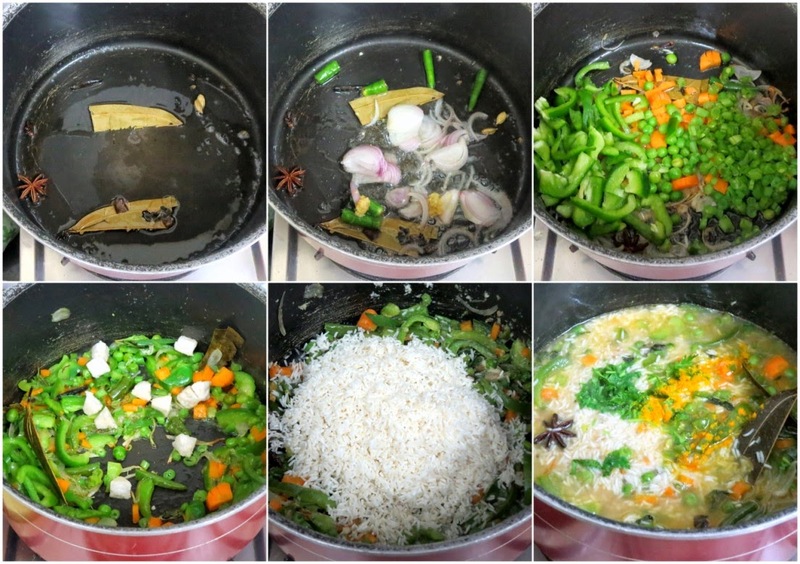 I had suggested four set of sequential alphabets, each to be cooked either on stove top, MW/ Steamed or Rice cooker. I had the most tough time browsing through my collection. Though it was a though theme, I had the pleasure of flipping through my collection. I almost thought I will choose one medium myself. Then decided to see if I could actually call the alphabets in different modes. As of now, I have two posts done, tomorrow's post is still not done. I was hoping on the Sunday to get these done, as usual I had so many other things coming up, that this got pushed back! 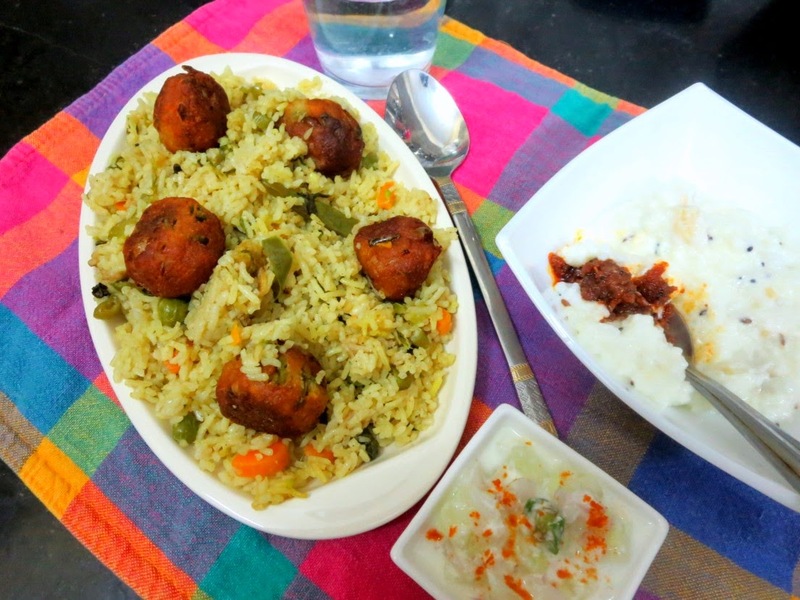 The inspiration for today's post is from Viji of Vcusine. 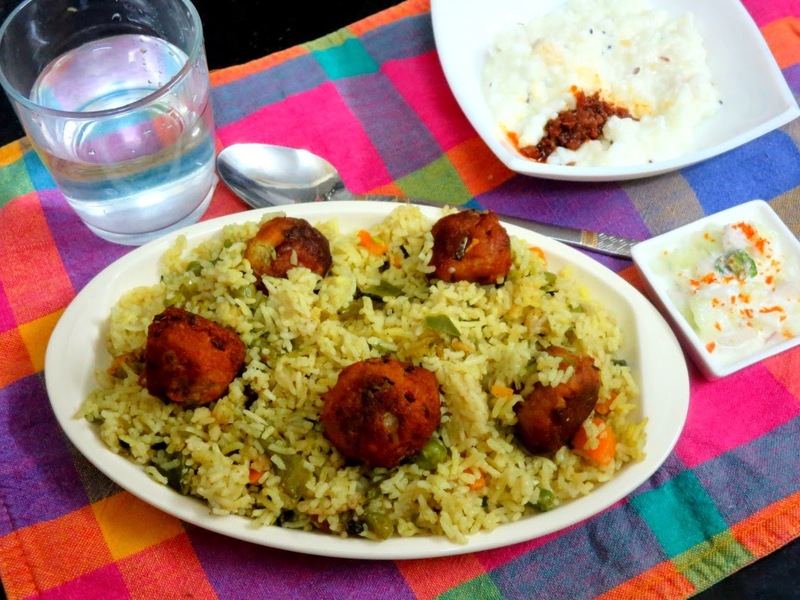 She had done it differently, by laying the pulao and with vegetable mix and then baking with the koftas. Since I had to use only one method, I made the recipe and ingredients differently. Wash and soak the basmati rice for 20 mins. In a non stick pan, add the oil, ghee, saute the whole spices for couple of minutes, then add the onion juliennes, green chilies, saute till the onions start to change colour. Then add ginger garlic paste, saute well. Next add chopped vegetables, salt and simmer for 5 mins. Then remove the lid, add the coconut paste, simmer, let the coconut paste get mixed well. 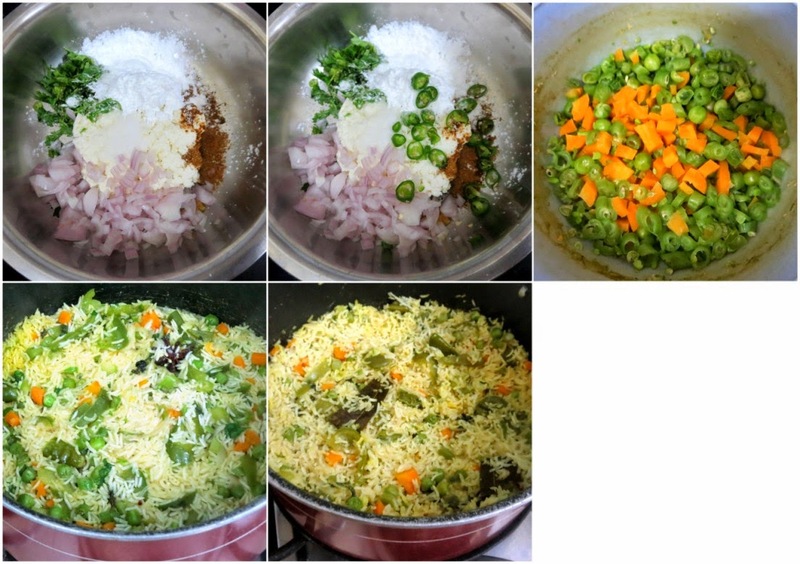 Now add drained rice and combine everything and finally add water, turmeric powder. Bring to boil. Once the water starts to boil, simmer and cook for 15 mins. When the water is all absorbed, keep a pan over the flame and place this pot over it, so that the rice gets cooker further indirectly. Fluff well and let it remain hot. Chop and blanch the vegetables in MW for 7 mins. Remove and roughly mash it. MW the potatoes and peel the skin. In a wide bowl, take the finely chopped onions, cumin powder, garam masala, salt, corn flour, boiled aloo, crumbled paneer, mashed vegetables. Mix everything well. 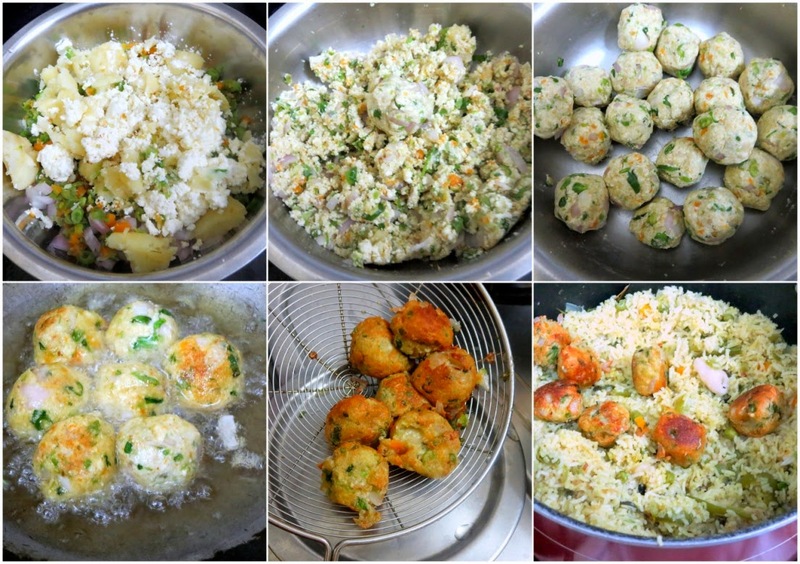 There is no need for adding anything else, but if balls are not getting formed, add some more corn flour. Make small balls and complete the entire mix. Make sure you cook the koftas over medium to high heat, else the koftas will drunk more oil and will become soggy as well. 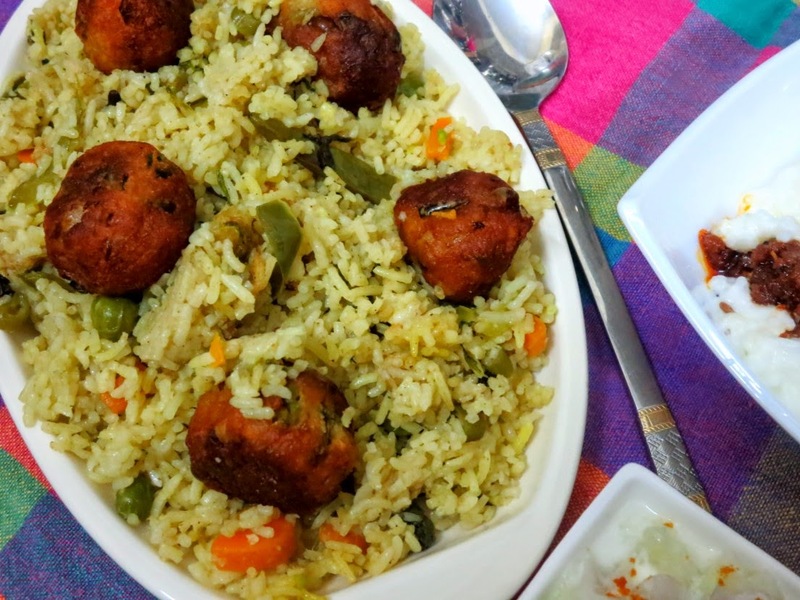 Once you have fried all the koftas, add to the cooked pulao, saving some for the final garnish. 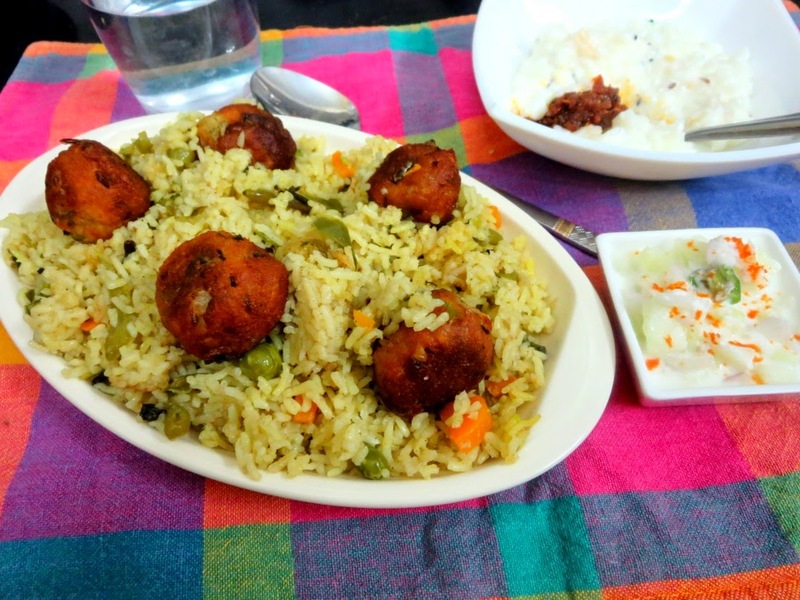 Cover the pulao tightly and cook on low flame for 5 mins. When ready, garnish with the remaining koftas, and raita.